Add it to your salads or blend it into a glassful of juice or smoothie, papaya (or papita), makes for an excellent summer delight. This low-calorie fruit has many health benefits to offer. According to the book Healing Foods by DK Publishing, it is known to have antibacterial properties and promotes good digestion, and almost every part of the plant can be consumed. It is a good source of antioxidant carotenoids such as beta-carotene that helps protect eyesight. Moreover, papaya leaves have even been found effective against dengue fever. Papaya has long been used as a meat tenderiser too. High in fibre content, it is said to manage conditions like constipation. While the sweet orange delight is celebrated for its many benefits, it has certain side effects, too, if consumed in excess. This all-rounder has some significant side-effects that you’ll need to watch out for. We list out some common side effects that may convince you to reduce the quantity of consuming papayas. Please note that the side effects may vary from person to person. Most health experts advise pregnant women to avoid eating papaya as the papaya seeds, roots and infusion of the leaves can harm the foetus. An unripe papaya fruit has high concentration of latex that can cause uterine contractions. The papain component present in the papaya may damage certain membranes in the body that essential for foetal development. 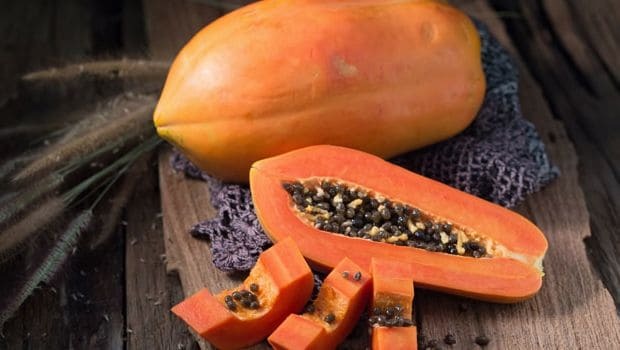 According to the US National Library of Medicine, papaya may interact with blood thinning medications, which can lead to easy bleeding and bruising. Fermented papaya could lower blood sugar levels, which can be dangerous for diabetics. It is always best to consult a doctor, especially if you are a diabetic who is on medications. The papain in the fruit or pollen from the flowers can lead to certain allergies. Some of the reactions may include swelling, dizziness, headache, rashes and itching. The enzyme papain present in papaya is said to be a potential allergen. Excessive consumption could cause different respiratory disorders like asthma, congestion and wheezing. It is best to avoid eating papayas in large quantities in order to prevent health issues. In case you have any disease, consult a doctor who will be able to guide you better as to how much amount of the fruit is safe for you.